Every so often, a business will get things just right so that they go from a small shop to boasting a national reputation. Stumptown Coffee Roasters is that business in the coffee world. For about four years now, I've heard nothing but praise regarding Stumptown, located in Portland, OR. I've heard they have amazing espresso and wondrous baristas. I've heard they offer french press coffee out of a huge press. 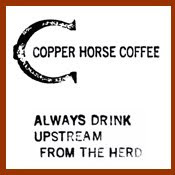 I've even heard of coffeehouses sending their employees there to get training. Whether or not all this is really true is not all that important (I'm pretty sure it's all truth). The fact that all of this chatter has invaded my skull from people of all walks of life and levels of coffee passion amazes me. So you can imagine my elation when I finally got to make a stop out to Stumptown a couple weeks ago. A good pal of mine and I were driving down to Oregon from Seattle and were due to stop in Portland that night. Unfortunately, we hit Portland on a Sunday so nothing was open and had we traveled several months earlier, we would have missed Stumptown as well. 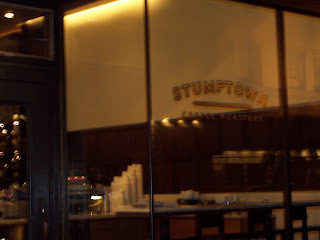 Fortunately, Stumptown opened their newest location in the Ace Hotel recently where they're open til 11 PM on Sundays. So fast forward a long hunt to find a decent dinner location (half successful at the Dragonfish, as the entrees were good but sushi a little lacking) and we find our hero at Stumptown Ace at 1030 PM. I had expected the baristas to be closing up (the town seemed dead) but to my surprise they were alive and perky. The exterior is nonchalant, with the name in the window but no real tell-tale markings to make it jump out. The interior was a beautifully sleek operation with a long counter and a relaxing vibe. 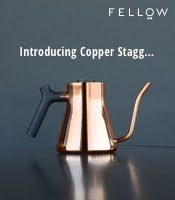 They obviously roast their own coffee and take careful measure to brew it well. At this particular operation, they brew all their coffee on 4 (!) specimens of the Clover 1s. I think I had an Ethiopian (or something African, it was late), which sampled a beautiful, full cup of unfiltered java. The espresso is where I really was wowed. While the barista dialogued with me as she pulled my shot, she felt the shot was poor and so poured it out. She did this twice more, not liking the consistency of her shots. Finally, on the fourth shot she seemed satisfied and handed it to me gingerly, and then gave it to me free of charge because it took so long! I never, in all of my coffee exploits, have ever come across attention to detail (not to mention the amazing results) and customer service like that! So to summarize simply, if you were to go out of your way to stop at one coffee operation in your lifetime, let it be Stumptown. And if you're looking to move to Portland, can I come visit you? You are soooo right. I live way over on the Eastside of Portland. I bus everywhere. I heard of Stuptown coffee and good they were supposed to be. It seems like 95% of expectations in life fall short. My experience of my first Latte at Stumptown was in the very rare 5%.I'm all about 2 shots and a Vanilla Breve. That cool Spring day waitng in a fairly long line at Stuptown led me to a blessing in disquise.The young attractive lady who went to making my Latte Breve with Vanilla forgot the Vanilla. I was a little upset and did'nt want to wait in line again, so I added a little sugar and WOW! The amazing quality of that Hair Bender espresso came to life. Now it's plain Breves forever.Perfect coffee complimenting the creamy texture of the cremer. My new Coffee Love. She is always worth the travel and wonderful anticipation. Batdorf is world class but has no representation in PDX, human or otherwise. That all changed this summer, when I started representing Batdorf & Bronson in Portland. We're in several bakeries and cafes, and are actively expanding. If anyone would like more information, please feel free to contact me. mmmmmmm stumptown. for almost 2 years I had the pleasure of having it every morning, and often in the afternoon. the espresso became my heroine and i grew to live with the ever present caffine shakes. it was worth every tremble and stuttered sentence. Stumptown came to Seattle a few years ago. In the land of coffee, where indy coffee shops, abound, Stumptown has been able to establish a following. In visiting their coffeeshop/roasting facility on Capitol Hill, we've been impressed by their committment to the craft of raosting and purveying coffee. And that intentionality carries over to the architecture from which they produce their high quality coffee. Check out our photos of their coffee house at 12th & Madison. You nailed it, Bill! Stumptown is a must-visit destination when in Portland. I always bring back a couple pounds of the stuff on my visits, a certain necessity after all of the craft beer consumption. Prices are a little high, but to be expected from a specialty roaster. It's definitely worth the couple of extra dollars per pound for the quality you get. Grab a VooDoo donut and cruise over to Stumptown for a cup of Joe!